Bali is on many people’s must see list. And after seeing some of the real Bali, I can understand why. When you are in the rice fields and away from the crowds Bali is like no other place I’ve seen, and the local people are beyond lovely and kind. For my overview on Balinese culture and etiquette for LuxuryAndBoutiqueHotels.com. Picking a place in the countryside will get you away from tourist crowds and give you the opportunity to meet Balinese people and learn more about their unique culture. Less crowded than some of Bali’s other top sites (and, blessedly, the taxi touts simply hold up a sign rather than following you down the street…. ), most visitors to Bali have Ubud on their must see list. A stop in the artists’ shops, a visit to the sacred monkey forest, great food and a good chance of seeing a religious procession are just some of the reasons most have a soft spot for Ubud. However, I recommend staying outside of the town proper. 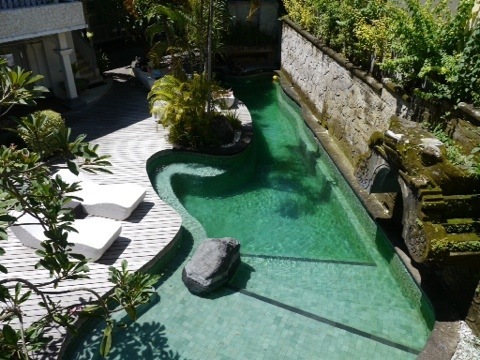 This was my private pool, in my private villa outside Ubud, at an eight-suite villa hotel called Chapung SeBali. Yes, the pool was just one step outside the bedroom! It was so peaceful there, near the village of SeBali. In the daytime, dragonflies flitted above my pool (chapung means dragonfly), and in the evening there were fireflies. The rice paddies were a green beyond belief. Click HERE to read my feature for LuxuryAndBoutiqueHotels.com. The small city of Sanur is very popular with families visiting Bali. It is quieter than Seminyak and the sea (on the east side of the island) is calmer for swimming. There’s a paved path along the beach which is great for strolling and for cycling (at a slow pace, it can get crowded). My very last hotel review from my four months in Southeast Asia was in Bali, at Mahagiri Villas near Sanur beach, and it was a fantastic way to end a fantastic trip. 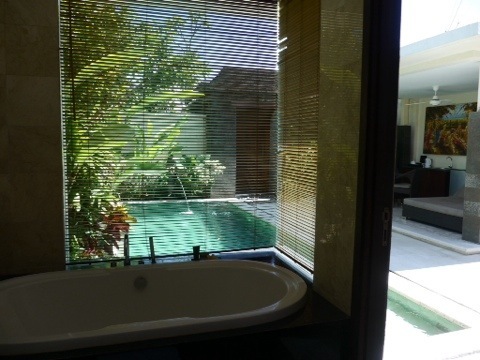 Yes, I very much enjoyed this bathtub overlooking my private pool, as well as the pool itself! You can read more about Mahagiri Villas HERE, in my feature for LuxuryAndBoutiqueHotels.com. Pondok Ayu is another Sanur choice. It is a tiny boutique hotel about a 10 minute walk from Sanur beach. Pondok Ayu has just four rooms and one suite, and it gets a lot of returning guests for its great price, homey atmosphere and charming staff. My feature for LuxuryAndBoutiqueHotels.com is HERE. A popular beach area in Bali is Seminyak. It is a bit more upscale and has good nightlife, restaurants and shopping. But finding a place to stay that is both nice and a reasonable priced can be difficult. Enter Villa Kresna. There are two locations — one with surprisingly large and value-priced rooms, and the other with even larger (and slightly higher priced) bigger suites called villas, many with private pools. Read the feature on LuxuryAndBoutiqueHotels.com HERE. Regardless of where you choose to stay, make sure you get out and see a few different parts of Bali. One corner of the island is so different from another, you’ll want to find the perfect spot for your next visit!